Until the current BROADWAY at the Hobby Center offering, I had somehow never managed to actually see a production of the longtime hit musical, PIPPIN. I recall once reading a lengthy plot summary of that show, and thinking at the time how could such a seemingly wacky and convoluted story succeed on the stage? Now I know the answer, and the musical’s continuing popularity is fully justified in the belated eyes of this critic. With its witty book by Roger O. Hirson and lively, pleasant music by Stephen Schwartz, there are eye-popping visual delights awaiting those lucky enough to capture a ticket during this limited run here in Houston. With splendid direction from Diane Paulus, the show’s unusual storyline surrounds a rambunctious traveling troupe of circus-like performers that present a play about the young medieval prince, Pippin (Brian Flores), son of the often warring French King, Charlemagne (John Rubenstein), stepson to the vain and flamboyant Fastrada (Sabrina Harper), and stepbrother to her not-to-bright son, Lewis (Erik Altemus). Overseeing the staging for this motley troupe is the important character of the Leading Player (Gabrielle McClinton), who serves as both director and narrator while the story progresses. For atmosphere, think of a somewhat tarnished Camelot or Knights of the Round Table, with lots of silly twists and turns reminding one of a children’s fairytale storybook. The few sensuous and playful seductions that take place are more like circus acts themselves, and would probably only offend the most sensitive parents of young children. There is not a lot of logic to everything that happens, but there is abundant fun and fascination around every corner. The King and his rowdy stepson, Lewis, are heading off to war and Pippin finally convinces his father to let him come along. But the battlefield does not fulfill Pippin’s search for meaning in life and he drifts off to the estate of his Grandma, Berthe (Adrienne Barbeau) where she gives him advice about getting some fun out of life. Barbeau, fondly remembered for her role in the TV series, “Maude,” is sensational here and may be the best looking and most acrobatically and vocally talented “grandma” on record. 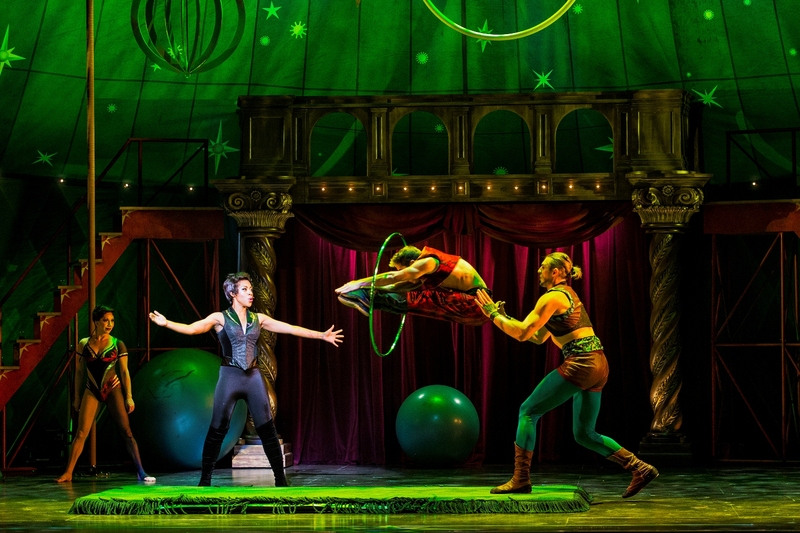 Her performance is a highlight with the emphasis on “high,” as she shows her skill as a singing trapeze artist. Speaking of vocally talented brings me to the subject of this entire cast. What a collection of first class singers we have here, with young Mr. Flores (in his astonishing Broadway tour debut), and multi-talented Miss McClinton each displaying thrilling vocal power in the show’s many engaging songs. His warm and embracing, “Corner of the Sky,” and her eye-poppingly sassy, “Simple Joys,” and the seductive, “Glory” would be perfect examples. The latter number featured McClinton in a jazzy dance trio with the signature hats and canes that characterized some of Bob Fosse’s original choreography. (Choreographer for this current sparkling revival is Chet Walker). As for Flores and McClinton, they both light up the room throughout the performance, her with a commanding stage presence, and he with the handsome beaming smile and energy of youth, yet the polish of a Broadway veteran. This young actor appears destined for stardom. 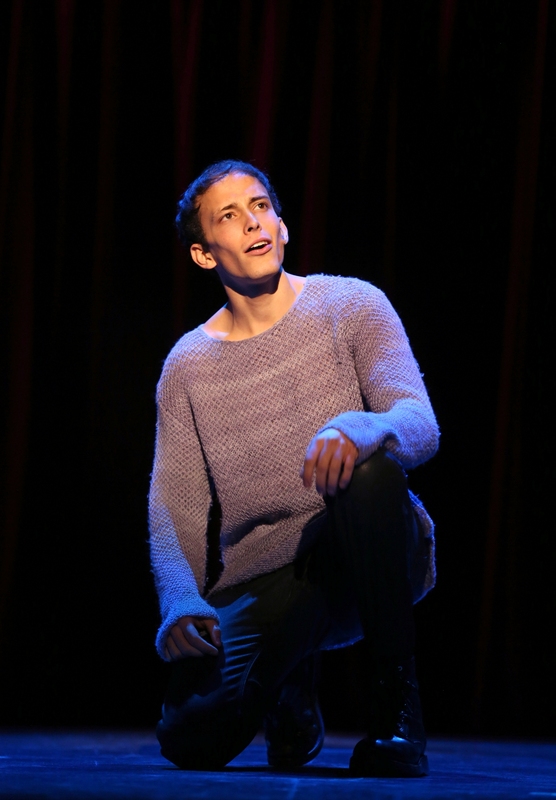 As the king, Mr. Rubinstein is another vocal powerhouse (“War is a Science”), and he brings us a lifetime of stage experience having originated the role of Pippin in the original 1972 Broadway production. As Pippin continues his quest for meaning in life he comes to believe his father the king is exploiting the peasants and must be destroyed. The events that follow eventually bring Pippin to collapse in despair, but he is rescued by a new character in Act Two, the lovely widow, Catherine (silken-voiced, Bradley Benjamin). To say too much about all that would spoil some of the fun for future audiences. But it is worth mentioning that the youngest member of the cast, Jake Berman, does a terrific job as Catherine’s moody young son, Theo, who by the way, has the voice of an angel. What, you might say, can make “fun” for the audience in a plot so full of twists and turns? In addition to the lovely music and uniformly wonderful voices already mentioned, the “magic and mystery” alluded to in my headline are present throughout the show. The mysterious acrobatic circus displays from the talented ensemble are dazzling, and the show’s numerous wonderful magic tricks and illusions are nothing short of amazing. I’m still puzzling over those. (Illusions by Paul Kiev, Circus Creation by Gypsy Sneider). The whole visual look of the production has an enchanting quality, with its color schemes changing beautifully from scene to scene. (Scenic design, Scott Pask, lighting design, Kenneth Posner). The funky and colorful medieval costumes (designer, Dominique Lemieux) add to the storybook glow. To enjoy all these wonders, theatergoers should hurry to the Hobby Center before the magic disappears following Sunday’s matinee. 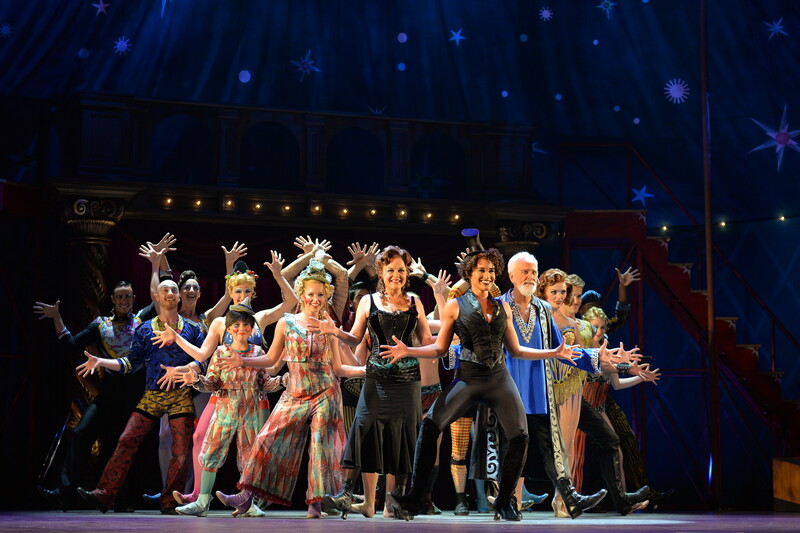 PIPPIN continues at Houston’s Hobby Center through Sunday, October 25th, with performances Thursday and Sunday at 7:30 PM, Friday and Saturday at 8:00 PM, and 2 PM matinees on both Saturday and Sunday. For tickets and information call 800-982-2787, or visit the website at BroadwayAtTheHobbyCenter.com. 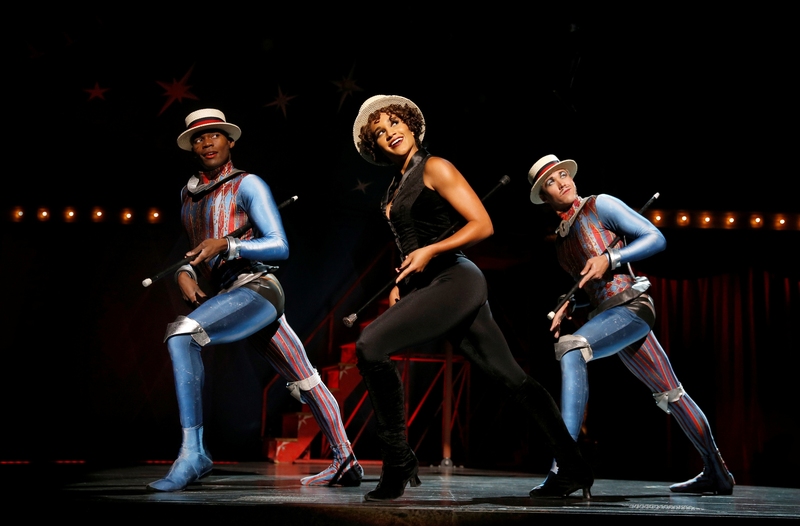 This entry was posted in Adrienne Barbeau, Bob Fosse, BROADWAY at the Hobby Center, BroadwayStars.com, HERE Lifestyle & Entertainment, Houston Community Newspapers online, Houston's Hobby Center, PIPPIN, Stephen Schwartz, The Courier Columns, ThePeoplesCritic.com, Uncategorized and tagged Broadway, PIPPIN. Bookmark the permalink. Glad you enjoyed the musical. I am writing this from the Choushatta (sp?) and doing just fair. Enjoy your tennis this AM–I played a decent 9 holes of golf yesterday. Today is our 55th and we start back to Houston later this AM.